Healthy food on the go is a big hit with me as I am always running somewhere and a quick fix is sometimes the only option! Kabuto is a brand that my Dad eats quite a bit and when he went shopping he noticed a rice noodle gluten free version and brought me them to try! I squealed in excitement when I saw them as I have said for such a long time I wished there was a gluten free pot noodle/ rice pot type product where you can just add hot water as these make quick lunches so easy. The biggest trouble is even if the carb is gluten free, such as rice, the flavouring isn't! I know at the time of buying, they were 2 for £3 in the same mix and match deal as the regular Kabuto noodles in Sainsbury's. These are not in the free from isle, and can be found with the regular pot noodles in the dried food isle. The two gluten free flavours are chicken and Miso, I have yet to try Miso but based on the Chicken I am expecting great things. On the allergen information the Kabuto chicken rice noodles contain milk and soya. Reading through the ingredients there is no egg or gluten ingredients. This pot once prepared is 450g and only 280 calories. I actually found this was quite big for lunch and couldn't manage it all, but if I'm looking for something more substantial, this will be my first port of call. I would even say this would be a good quick dinner. See chart I created below for full nutritional information. 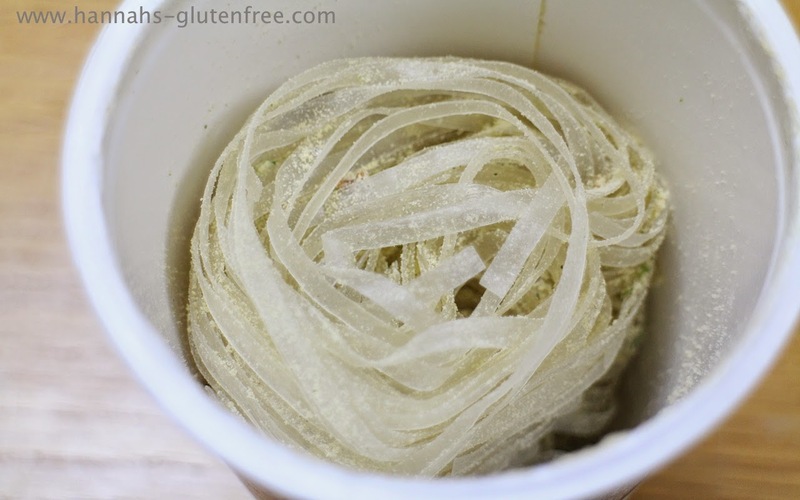 When opening the pot, there is a whole nest of noodles and a powdered flavouring. The flavouring has no preservatives and all ingredients are understandable and relatively clean, unlike a typical pot noodle, which pleases me as I do not like too much processed food in my everyday diet! Once hydrated the product reminds me very much of a typical asian noodle soup. 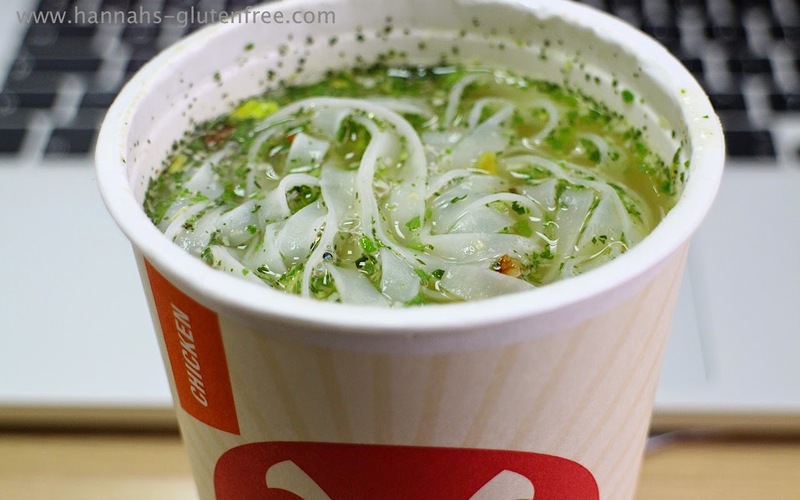 A thin flavourful water based herb infused soup with a kick to it, thin soft noodles combined and small pieces of chicken. It is very authentic in flavour and is one of the best noodle soups I have had in a long time. As mentioned I found that there was a huge portion in the container. They suggest pouring it into a bowl. I did not have one at work but I would assume it would be quite a large bowlful, even suitable to share for lunch or a single dinner, depending on how hungry you are! Overall I would 100% recommend and purchase this again as £1.50 is a fantastic price for a filling healthy lunch or dinner and the flavours are fantastic. I really enjoyed this and think even those not following a free from diet would enjoy this pot.